UCLA students who won awards at a biomedical research conference. 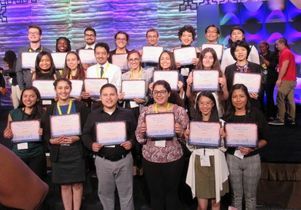 UCLA students won more awards than students from any other university at the recent Annual Biomedical Research Conference for Minority Students, the largest research conference in the nation for students from underrepresented backgrounds. Forty-three UCLA students presented their findings and of the 300 awards handed out, 24 went to UCLA student presentations. The students who attended the conference presented in 11 of the 12 scientific disciplines: physiology, neuroscience, microbiology, immunology, developmental biology and genetics, engineering, physics and math, computational and systems biology, biochemistry and molecular biology, cancer biology, cell biology and chemistry. 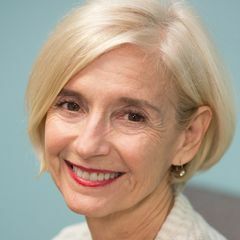 “It became clear as the presentations went on that UCLA was making an extraordinary showing in the receipt of a large number of awards,” said Megan McEvoy, professor of microbiology, immunology and molecular genetics in an email. There was an incredible showing of support from the UCLA group for their colleagues as every was announced, she said. McEvoy was one of seven UCLA science faculty to attend. She and Gina Poe, professor of integrative biology and physiology, and Tama Hasson, assistant vice provost for undergraduate research, direct several programs at UCLA for undergraduate research and attended the conference to support the undergraduate students from those programs. Tracy Johnson, professor of molecular, cellular and developmental biology, was on the conference steering committee and attended to support the students from her research program. The two remaining faculty members, Greg Payne, professor of biochemistry, and Patricia Johnson, professor of molecular biology, were there to recruit students to UCLA’s graduate programs. Patrick Allard, assistant professor in the Institute for Society and Genetics, was part of the program as a speaker. His talk, “The Toxic Sins of Our Ancestors Sponsored by Society of Toxicology,” introduced students to the field of epigenetics and discussed some of the recent findings in the field that describe the effects of environmental exposures on genetics. The faculty mentors reviewed the students’ abstract submissions and guided the preparation of many of their presentations. Some students even practiced their presentations with Hasson and McEvoy on the bus ride to Phoenix. More than 4,000 individuals from 350 U.S. universities attended the conference in Phoenix, Arizona in late October. McEvoy noted the importance of conferences like this for students from underrepresented minority groups. Scientists from these groups are still a small percentage of the professionals in science and engineering relative to their percentage in the U.S. population. UCLA student awardees at the 2017 Annual Biomedical Research Conference for Minority Students.